RetinaLyze v1.2.1 has just been released! Now it is possible to zoom in on photos of retinas. Click on the analysis in your overview or archive. Here you will have the possibility to click on “Zoom in” or “Zoom out” to have a closer look at the photo. Alternatively, you can pull the slider to the right of the buttons. In order to return to the standard zoom level you can press, “Reset”. If you have a need to save/download the photo to your computer this is available under “Details about photo”. The two buttons are called “Save photo with indications” and “Save photo without indications” will download the photo of the retina (with and without indications) to your computer. These two functions are of special interest and advantage if the customer wants to have a closer look at the photo, or if you want to archive the photo in a system not connected to RetinaLyze. Requests about changing the language in the work area to Danish have been made. We, of course, want RetinaLyze to be as user-friendly as possibly. 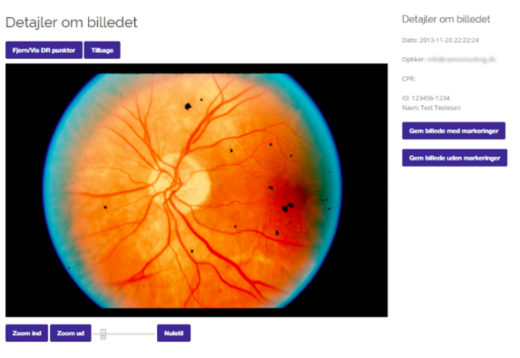 We are pleased to say that the entire work area (everything visible, when logged in to RetinaLyze) is translated into Danish. As a user of RetinaLyze you do not have to do anything actively to view RetinaLyze in Danish. The system will automatically be in Danish, if you have chosen Danish as the main language in your browser. If you need help for changing the language in your browser try following this guide. We are, of course, also available in providing help, so you are welcome to contact us on our support phone and support email. We at RetinaLyze System A/S want the RetinaLyze to be a safe and trustworthy system. 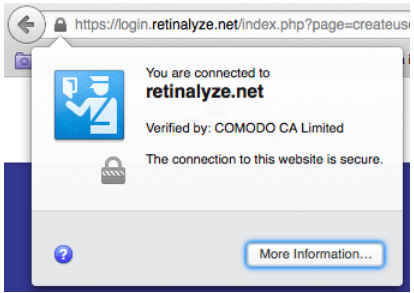 One way to secure a system, as RetinaLyze, is to use a SSL certificate. SSL, which is short for Secure Sockets Layer, is an encryption protocol that ensures that only sender and receiver can read the information sent. In other words, i.e. passwords, CPR numbers and other sensitive information will be entirely unreadable for hackers. As an extra benefit some users will also not receive warnings from bowsers (Chrome/Firefox/Internet Explorer/Safari), as the SSL certificate also ensures the browsers (and you) that we are, who we state we are. You can verify the authenticity of the certificate in your browser. As a standard, a little lock-icon or shield is visible next to the address bar. If you click this icon you will learn more about the certificate and out identity. The customers, who have asked for an activation of the “Send to Eye Specialist” module, will have the opportunity to use the function during today (8 December 2014). You can read more about the use of the “Send to Eye Specialist” in the mail about RetinaLyze v1.2.0 (sent 1 December 2014). Feel free to contact us, if you wish to activate this new module on your license.